During the last few years, our church choir has twice sung in worship my all-time favorite song, Psalm 121. You can (and should!) listen to a marvelous audio recording of the song here. I love the song for its biblical truth and beauty. My help, indeed, comes from the Lord who made heaven and earth. The imagery of lifting my eyes to the hills reminds me of awe-inspiring mountains. Perhaps because I’ve always lived in Midwestern flatlands, seeing the rugged majesty of mountain peaks immediately lifts my thoughts and praise to the Creator God. Artists from the Hudson River School painted sweeping landscapes that often portrayed man or other creatures as very small parts of an incredibly wide creation ruled by the Light. 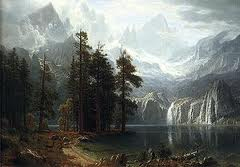 Albert Bierstadt is my favorite Hudson River School artists, who is also grouped with the Rocky Mountain School. 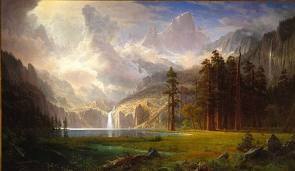 Prints of Bierstadt’s two paintings featured on this post hang in our living room. This background information may give you some idea of how meaningful Psalm 121 is to me and how it appeals to a wide range of human emotions and spiritual longings. who made heaven and earth (verses 1-2, ESV). will neither slumber nor sleep (3-4, ESV). God never sleeps. He never takes a break or vacation. He keeps your feet firmly planted in the truth of his word. He always cares for you and protects you. nor the moon by night (5-6, ESV). During blistering days when intense trouble saps our energy as we travel through this arid desert, God himself shades and cools us. During lonely nights filled with torments and terrors, he is with us and comforts us. He protects and keeps us now and into eternity. from this time forth and forevermore (7-8), ESV). God will protect you from the evil that threatens your life. He will keep your body alive now and your soul alive forever. He watches over you every time you leave your home and when you return to it. He watches over you now. He will always watch over you. Our lives and our times are in his capable hands. We are all tiny creatures in a vast cosmos, but we have seen the Light.